I love this piece of Jasper, it is so fabulous. Silver wire wrapped around it for a beautiful pendant. 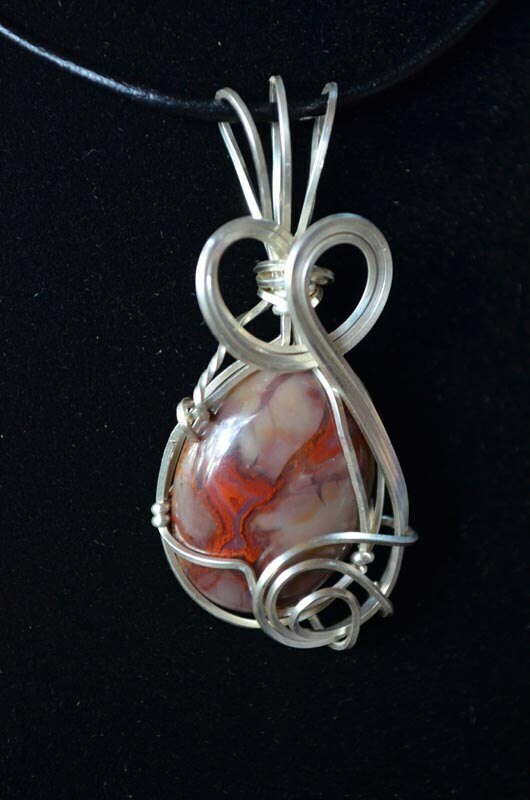 Jasper’s name is derived from the Greek word iaspi which translates as “spotted or speckled stone.” This red jasper is a form of chalcedony and is a variety of microcrystalline quartz and may contain up to 20 percent inclusions. These inclusions determine the color, pattern, and appearance of the final stone. Often Red Jasper is found mixed in with Green Jasper forming bloodstone. Also referred to as Brecciated Jasper, it is associated with the zodiac signs of Aquarius and Leo. Jasper is the birthstone for the month of January. The name Brecciated comes from the fine-grained matrix structure.